RIALTO VELASIL is designed to maintain a healthy, comfortable environment wherever it is used. It achieves the optimal balance between water repellancy and water-vapor permeability. The microporous structure creates a superficial "membrane" effect. This is a physical barrier to penetration of liquid water (rain) but doesn't stop the water-vapor that can easily permeate the substrate and the finish. The structure obtained from a siloxane based decorative finish is a film with a controlled and determined porosity. This porous structure grants an excellent water-repellancy and water-vapor permeability. 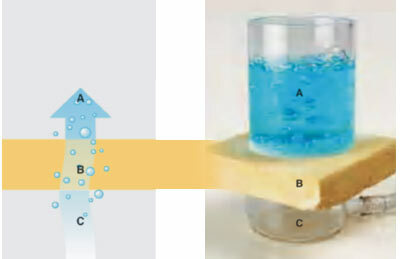 The molecules of water-vapor are much smaller than the porosity of the film, so they can flow easily through it, but not the molecules of the liquid water that are much bigger and stopped by this physical barrier. The substrate B has been treated with a siloxane primer. 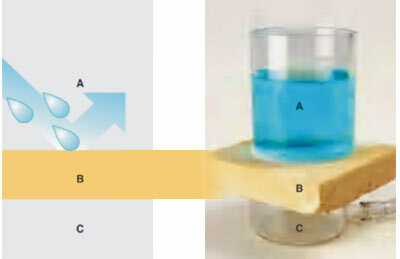 Water cannot flow from area A to C.
Water, if in a vapor form, can permeate the treated substrate B and flow up to area A.